Home » POLITICS » CARLOS A. REYNOSO NUÑO TAKES OFFICE AS GENERAL SECRETARY OF GOVERNMENT IN B.C. 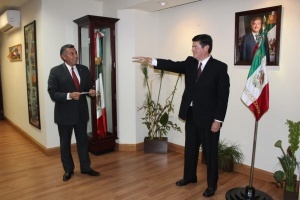 MEXICALI, B.C.- In response to his extensive experience in the state and federal public service, Carlos Armando Reynoso Nuño took oath yesterday as the new Assistant Secretary General of Government in the administration headed by Governor Francisco Vega de Lamadrid. The formal act of appointment was through the Secretary-General of Government, Francisco Rueda Gómez, who entrusted Reynoso Nuño to continue and strengthen the governmental premises that Governor Kiko Vega has outlined throughout his term. In the extensive political experience of Reynoso Nuño, he highlights having been Assistant Secretary General of Government in the state administrations headed by Héctor Terán Terán (R.I.P.) and Alejandro González Alcocer; he was appointed Undersecretary of the State Penitentiary System, Assistant Secretary-General of Government and Secretary of Social Development in the government of Eugenio Elorduy Walther; in the government of José Guadalupe Osuna Millán again headed the Secretary of Social Development, while in the federal government he was appointed head of the Government Unit of the Ministry of the Interior when José Francisco Blake Mora (R.I.P.) and Alejandro Poiré were appointed, this during Felipe Calderón Hinojosa Mexico’s Presidency. After taking oath, Reynoso Nuño expressed enthusiasm for joining the state administration once again and thereby giving special impetus to the mechanisms that allow improving organizational communication within the government agencies and related to dealing with civil society organizations with which in due course will have to engage in dialogues according to the faculties and responsibilities of the Under-Secretary-General in charge. Next ASUME CARLOS A. REYNOSO NUÑO LA SUBSECRETARIA GENERAL DE GOBIERNO EN B.C.